"David Wilson and crew have...further enhanced the WATT/Puppy's status as an audio classic." the sheer beauty of single-ended-triode amps." Features Highly evolved two-piece floorstanding speaker that uses advanced materials and custom drivers; high claimed sensitivity; optimized setup comes with the purchase price. Use "The fact that it can accommodate both the high-power and low-power amps with such aplomb makes the WATT/Puppy 7 the most universally applicable speaker [Marc knows] of." 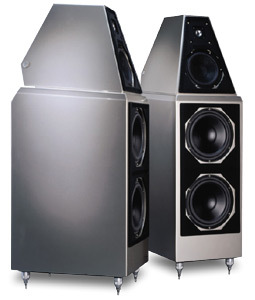 Value "A small-footprint floorstanding speaker that offers true state-of-the-art performance." Among the audio products for which the word classic fits is the Wilson Audio WATT/Puppy two-piece loudspeaker system. In its nearly 20 years of existence, the WATT/Puppy has undergone a number of minor and major revisions, and these are testament to the ingenuity of David Wilson's original concept. Although I had heard various WATT/Puppy iterations over the years, I came late to the parade via my review of the WATT/Puppy 6. To say I was impressed with that speaker would be an understatement. It became my reference because of its wonderful sound and abilities as a reviewing tool, and we named it our Reviewers' Choice Edge of the Art product for 2000. With so much going for the WATT/Puppy 6, why did Wilson Audio decide to update the speaker? The answer is that the company didn't set out to create a new WATT/Puppy, but with the development of the Sophia, the Wilson Audio engineering team learned some new applications for existing materials and experimented accordingly on the WATT/Puppy platform. Then a new Wilson Audio-designed woofer became available, one whose free-air resonance is 3Hz lower than the woofer in the WATT/Puppy 6. This allowed David Wilson and crew to tune the bass enclosure for deeper and more linear bass that would be more consistent from room to room, which is always a worthy design goal for a loudspeaker. The crossover was also radically changed to lower time-based distortion by over one-third compared to the WATT/Puppy 6's crossover. The effect here is that Wilson Audio now proclaims the WATT/Puppy 7 to be nearly as correct in the time domain as the company's flagship: the $225,000 WAMM system. Wilson Audio is well known for championing the use of advanced materials in its speaker cabinets, and the WATT/Puppy 7 is notable for a major change in this regard. The series-6 WATT was constructed of a mineral-filled acrylic-based material that had been used for the WATT for 15 years. For the series-7 WATT, Wilson Audio turned to its M material, a high-tech composite that's used in varying degrees in the cabinets of all other Wilson Audio speakers. In the new WATT, M material of different thicknesses is used along with lead ingots to make for a very dense, very heavy, very inert enclosure. Wilson Audio claims that the new WATT cabinet is 37dB quieter than that of the series-6 WATT. The Puppy also uses M material along with harder-than-steel X material in strategic places -- this is a key to Wilson Audio cabinets: materials chosen via extensive testing for specific applications. Another change occurs in the price -- an increase to $22,400 USD per pair. As with the WATT/Puppy 6, the 7 uses a 1" Focal inverted titanium-dome tweeter and 7" Scan-Speak carbon-fiber midrange -- both of which are customized at the Wilson Audio factory -- along with a pair of the 8" Wilson Audio-designed woofers, which are manufactured by Scan-Speak. The company will divulge nothing about the WATT/Puppy 7's crossover -- no points or slopes, no admission of parts used -- but I was able to see and photograph during my factory tour the Zero Halliburton aluminum case in which each crossover is potted. The speakers still come with a very detailed and well-written manual as well as a box of accessories, including spiked Puppy Paw feet for coupling the speakers to the floor. There are also the four different-height Phase Delay Correction spikes used for adjusting the tilt of the WATT on the Puppy -- thereby optimizing the speaker's time and phase correctness. This is an elegant solution, but one that is not nearly as involved as it is with the Wilson Audio MAXX, for instance, which is adjustable in 39 increments. Grilles are the fabric-over-frame type that also came with the WATT/Puppy 6. However, Wilson Audio can also supply simple foam grilles that are acoustically transparent and far superior in terms of sound to the more complex ones. Ask for them by name. The look of the speaker has changed a little, although it is still recognizably a WATT/Puppy. The lip around of the top of the bass enclosure is taller near the rear of the speaker and now completely hides the gap between the WATT and Puppy. The change makes for a more integrated look, although from the side the WATT looks like it is not sitting on a level surface (it is) because of the increasing height of the lip, an optical illusion of sorts. There are still a dozen finish colors available, but a few deletions from and additions to the WilsonGloss palette -- a new gunmetal blue is stunning. Wilson Audio undertakes a painstaking 12-step finishing process to ensure that a pair of WATT/Puppy 7s, or any of its speakers, looks like the luxury product that its price tag indicates. Say what you want about the cost of Wilson Audio speakers, but once you see how they are made (have a look at our factory-tour article for details) and what they look like once they're finished, you know they're not inexpensive. Wilson Audio specs the WATT/Puppy 7's frequency response as 21Hz-21kHz +0/-3dB, with sensitivity as 93dB. Minimum power is listed as 7 watts. Once the WATT and Puppy are united, the speakers measure 40 1/4"H x 12 1/4"W x 18 "1/2D. Pound for pound, the WATT, which weighs in at 65 pounds, is the most solid transducer I know of. The Puppy tips the scales at 105 pounds. The speakers are shipped from the factory in wooden crates, and a peel-away "frisk" is applied to the cabinets for added protection. Wilson Audio doesn't overlook even the smallest of details when it comes to the presentation of its products. I used the WATT/Puppy 7 speakers along with the usual suspects that make up my reference system -- Lamm ML2 mono amplifiers and L2 Reference preamp, Bel Canto DAC2, Mark Levinson No.39 CD player/transport -- as well as some of the products I've reviewed recently or will review soon. These include an Audio Research Reference Two Mk II preamp and 100.2 solid-state stereo amplifier, Mark Levinson No.383 integrated amp and No.434 mono power amps, and at the very tail end a Wyetech Topaz 572B single-ended-triode stereo amp. Interconnects and speaker cables used for the bulk of the review period were from Shunyata Research (Aries and Lyra) and Analysis Plus (Solo Crystal Oval and Solo Crystal Oval 8). Power cords were from Shunyata Research: Anaconda Vx, Taipan, and Python. I had Wilson Audio's massive WATCH Dog powered subwoofer on hand for use with the WATT/Puppy 7s. I used pairs of WATT/Puppy 6es and Wilson Audio Sophias for comparison. As with the Sophias, which I reviewed exactly one year ago, John Giolas, Wilson Audio's marketing director, set up the WATT/Puppy 7s. I had marked in tape where John had positioned the Sophias, and this ended up being almost exactly where the WATT/Puppy 7s came to rest. After some tweaking and playing various recordings, John had the speakers nearly where he wanted them sonically, but he then made an adjustment of a mere 3/8". The difference was truly amazing -- like cleaning your glasses after neglecting to do so for a few days. The soundstage, which was already very spacious, snapped into focus, and midbass resolution improved notably. The best thing about this treatment is that you'll get it from your Wilson Audio dealer, who will deliver, set up, and adjust your speakers in accordance with Wilson Audio's "voweling in" process, which works. Don't poo-poo this fine-tuning or consider it some kind of sales gimmick -- it's mandatory for getting the very most from the WATT/Puppy 7, and is even more important with the larger Wilson Audio models. I applaud Wilson Audio for making in-room setup a mandatory element in the proper use of their speaker systems. Once you live with a speaker for as long as I have with the WATT/Puppy 6, it becomes easy to pick up even the most minute of differences between it and another speaker, and this was the case with the WATT/Puppy 7. Two traits of the 7 showed themselves immediately -- our measurements can prove or disprove them. Foremost, it was clear that the bass of the 7, while just as impressive overall as that of the 6, was not as subjectively noticeable but a little bit deeper. There was still plenty of bass power and slam, but in comparison, the 7's bass made that of the 6 seem a tad too prominent. The WATT/Puppy 7 was also more sensitive than the 6 -- a half or full decibel, I would have guessed. But these were only the starting points for my assessment of the WATT/Puppy 7. As impressive as the 6 is, the 7 improves on it in many ways that are significant to long-term enjoyment of music. The most obvious of these is also the one that's the most difficult to describe fully. Call it integration, harmony or balance, but the WATT/Puppy 7 is a speaker that conveys so much information in a completely natural and involving manner that it readjusts expectations for reproduction. In some ways, the 7 is an amalgam of the Sophia and the WATT/Puppy 6, but it is even more musically satisfying and resolving than either. Among the recordings I've been playing heavily this year is John Hammond's great Wicked Grin [Pointblank 7243 8 50764 2 8]. If you don't have this CD but are even the least bit curious about how well a strict bluesman can cover Tom Waits's eclectic songs, buy Wicked Grin and find out -- you won't be disappointed. Via the WATT/Puppy 7s, the vast sonic panorama on "Clap Hands" is positively packed with layered detail, and yet it all unfolds in a gentle manner, Hammond's voice emerging from between the speakers with realistic texture and drive. To be sure, the WATT/Puppy 7s suspend disbelief; they're seemingly all signal and all music. The WATT/Puppy 7s are also very composed speakers, ones that impart so little distortion and internal noise -- subjectively less than any speaker I'm aware of -- that they heighten the perception of harmonic texture and inner detailing. To my ears at least, Wilson Audio's claim of the 7 being quieter than the 6 makes sense. Wicked Grin is a good test of this, but one that's even better is bassist Tony Overwater's Up Close [Turtle Records 198119], a recording that's spacious and detailed in the extreme. I've used "Ironic" as a demo track since I purchased the CD, and over the WATT/Puppy 7s, Yuri Honing's sax blasts into the room with gale-force power but always sounds controlled and utterly pure. Near the end, Honing blows air and saliva in bursts, and the 7s are able to convey this low-level spittiness and the musical necessity of it. The WATT/Puppy 7s get the major events like Honing's sax eruptions right, often making them seem even more vivid than I remember, but they also communicate the smallest of details too -- all completely in service of the musical message. The bass of the newest WATT/Puppy is impressively deep and weighty, able to convey the heft and mass of live music like no speaker I've heard short of Wilson's own MAXX. Slam and physicality are consummate, as I heard on my de facto bass-reference CD, Suzanne Vega's Nine Objects of Desire [A&M 31454 0583 2]. But don't think that the WATT/Puppy 7 is a speaker to satisfy bass lovers only. The transition from the treble to the midrange is better than I have heard from any dynamic design, and the quality of both regions is as high as it gets due, once again, to consummate resolution and musical communication. Aimee Mann's high, whispery voice is a challenge for speakers to get right. Prominence in the vocal range can make Mann's voice sound brittle; too little overall resolution and she loses her characteristic delicacy. Mann's latest recording, the great Lost in Space [Superego SE-007], sounded just right over the WATT/Puppy 7s: beautiful, fragile, and emotive. The WATT/Puppy 7's dynamic capabilities can be crushing with large-scale music and big-time solid-state power, or delicate and able to convey the nuance-laden interplay of a small jazz ensemble as well as the sheer beauty of single-ended-triode amps. These are speakers that can turn on a dime, going from very loud to very soft with realistic speed and range. A great test of this is a recording of Carmina Burana, and my favorites are both from Telarc. As much as I like the more recent recording with Donald Runnicles and the Atlanta Symphony Orchestra and Chorus [Telarc CD-80575], I prefer the older version with Robert Shaw and same group of musicians and singers [Telarc CD-80056]. "O Fortuna" goes from loud to soft to very loud with realistic scaling and speed, and when the soloists are front and center, their slightest vocal inflections are communicated fully and with great drama. Because of the 7s' slight additional bass depth, I found that I needed to adjust the Wilson Audio WATCH Dog subwoofer to compensate in terms of the low-pass frequency at which it was set. On so much software, the WATCH Dog makes no contribution, but when really low bass tones are apparent, you will know, perhaps in startling fashion as the WATCH Dog springs to life and rattles your house at its very foundation. Doug Schneider had told me about Greg Keelor's brooding Gone [WEA CD 17513] and the bass tones on it, wondering just how low and weighty they are. Very at the beginning of "When I see You" and at a few other places throughout the disc. Of course, you don't need a subwoofer with the WATT/Puppy 7 -- as my earlier comments about its bass performance attest. But, boy oh boy, can such a subwoofer be enlightening and just plain fun. Another subject peripheral to the WATT/Puppy 7 is amplification, and here your choices are wider than with any other speaker I know of. If you need a speaker that can handle 500 watts of solid-state power, this is it. You can push the 7 to literally deafening levels and it doesn't make you pay with hardness, brightness or any other malady -- unless it's intrinsic to the amps or something upstream from them. You can also use this speaker, as I did for the most part, with single-ended tubes, in which case it becomes one of a handful of speakers that should be on any short list for such application. And the fact that it can accommodate both the high-power and low-power amps with such aplomb makes the WATT/Puppy 7 the most universally applicable speaker I know of. I've noted above some specific ways in which the WATT/Puppy 6 and 7 differ, but I hope that doing so doesn't leave you with the impression that the 6 is far inferior or, even worse, that there were faults in the original that I didn't recognize. Neither is the case -- the WATT/Puppy 6 is still a world-class loudspeaker and will be for a long time. If some unknown company were to unveil it today, audiophiles and reviewers would be wildly enthusiastic about it, but because it carries the Wilson Audio name and has been replaced, the enthusiasm wanes. If you own a pair of WATT/Puppy 6es, be secure in the knowledge that you still have one of the finest loudspeakers available, but one that has been bettered in some important ways. All of this said, I will state that the 7 is a more pure-sounding speaker than the 6, and an even more dynamic speaker as well. It sounds more neutrally balanced than the 6 and, most important to me, more involving and natural. Bass may be a wash subjectively, with the 6 sounding more prominent down low, but to my ears the 7 goes a little lower still and with even more control, something that the 6 didn't lack. Voice sounds clean and pure over the 7, a small improvement over the way the 6 handles the vocal region. Both speakers convey well the character of partnering equipment, but the 7 is superior in this respect too. I could live easily with the WATT/Puppy 6 and the Sophia for that matter. In fact, I would be doing just that if the 7 didn't exist. Above all, the newest WATT/Puppy shows how viable the two-piece platform is and how ingenious the engineers at Wilson Audio can be when it comes to squeezing even greater performance out of it. Call it refinement, upgrade, or modification, but with the WATT/Puppy 7, David Wilson and crew have made an already great loudspeaker sound even better and further enhanced the WATT/Puppy's status as an audio classic -- an impressive achievement. I was especially delighted with the 7's purity and naturalness, both of which translate to great enjoyment of music, but the bass power, explosive dynamics, and high resolution that are WATT/Puppy earmarks are all in abundance too. At $22,400, the price of a pair of WATT/Puppy 7s is steep, but so is the climb to commensurate levels of sound quality with competing speakers -- if indeed they have been reached at all outside of Wilson Audio's Provo, Utah headquarters. The WATT/Puppy 7 is a small-footprint floorstanding speaker that offers true state-of-the-art performance. It is also the finest speaker I've heard in my system -- with solid state, low-power tubes, and everything in between. Hey, Christmas is coming. Maybe Santa's sleigh can hold a pair for you. Price: $22,400 USD per pair.